Dash n’ Grab Art – How to Appreciate Great Works in One Tenth Of A Second. Ah, how a middle class English mother’s heart swells with pride when her 10-year-old son, out of all the available attractions in London, chooses the Tate Modern. Felix has always loved this extraordinary conversion from a power station to an art gallery. It is ostentatiously huge, and – with lines to marvel at – it dwarves the ants who come to see it every day, swarming in though a slit at its foot. And, cynic that I am, I thought it was because of all the buttons there were to press. 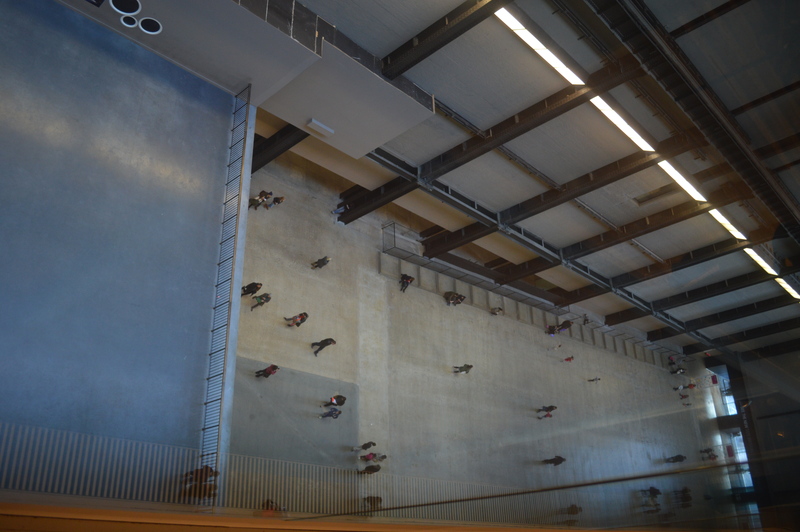 There is always, on something mindblowingly high like floor five, a children’s interactive display. Felix stands at the balcony, overlooking ants far down below, and presses buttons and screens to his heart’s delight. We filed mechanically in with the swell of art-lovers. We went to the information desk. Excuse me, I asked, but which floor had the most buttons to press? The man looked at me just exactly as if I were an ant, and he said: floors three and four. I don’t know if he knew what he was talking about because we chose floor five anyway. And when we arrived, wheezing and panting- Felix the liftphobic insisting he and I took the stairs – there they were. Touchscreens asking what we thought of the museum. Heaven. But there was a queue, even on a Thursday. And when we did get to them the whole system had frozen. We confused the system a bit more by trying to repair it, but to no avail. So Felix and I thought: there is nothing for it. We will just have to look at Art. So off we went. Over the years, I have learnt there is only one way to appreciate art when you have a small boy in tow, and that is fast. He scoots from image to image like a gnat; yet every now and then, something will cause him to hover. And none of us know why. Some exhibit or other will ring a bell, will fit with a pattern which lurks like a crocodile in the unconscious, waiting for synchronicity. This art works like Monty Python; it accesses constructs deep within us that we never even knew were there. So we dash. And I grab my camera and snap the stuff which rings bells. A 3D Picasso sculpture (did he do those? ), Candy-sweet Kandinski good enough to eat; Lynda Benglis’s Meteor which looks like someone has just poured lead in a corner of the old power station; firewood, in the form of Giuseppe Penone’s Tree of 12 Metres. And there’s the rub. We walked through these galleries filled with odd, off-the-wall stuff, and each thing made us think in a new directions. Every place Felix hovered, we considered stuff we had never considered before in our lives, and dug deep to find where it fit in our world. Horizons and planes broadened before our very eyes. The world widened. And all from a dash-and-grab art raid. 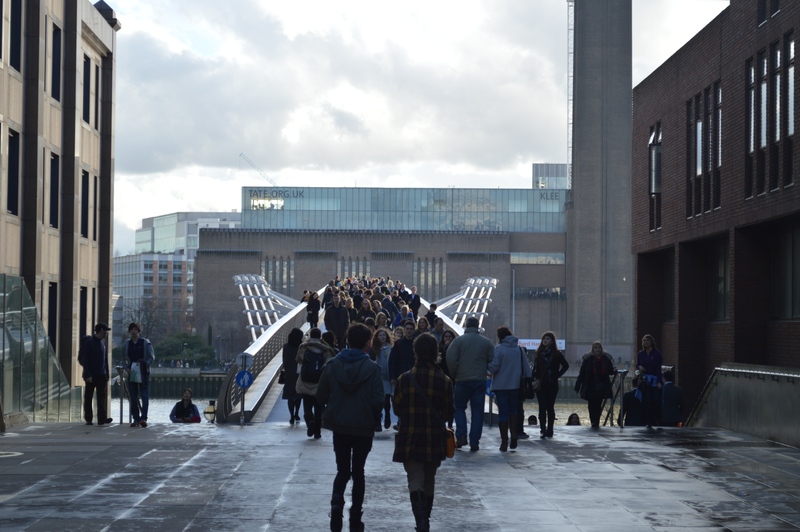 Posted in Places to visit, Shrewsday MansionsTagged art, Britain, London, Tate Modern, travelBookmark the permalink. Pretending in sun circumstances is a barren wasteland, I always think, IE. We have to trust our on reactions to these things: they are true to us. I sneer at the blobs and shapes and at the pile of gloop. Blobs and gloop–I love it! The phrase and the actual works of art. Like most endeavours there will be good, mediocre and bad works, but Tate Modern always stimulates and makes me see the world and my experiences of it anew. I don’t think I will ever progress to being able to regard bits of battered bicycle randomly stuck together, and the like, as being works of art. Just as I cannot accept an unrelenting cacophony of discords as being music. To me, these are all symptoms of the Emperor’s New Clothes syndrome. Well, Col, since these clothes have been around for a century or more now I suppose we must refer to them as the Emperor’s Old Clothes! Indeed. One would have thought the majority would have seen the joke by now instead of exclaiming euphorically at the wonderful cut and style of what is actually wrinkled skin. I see I’m never going to persuade you! My feelings exactly, Chris. I am no aficionado, and I won’t fight for something which seems entirely redundant. 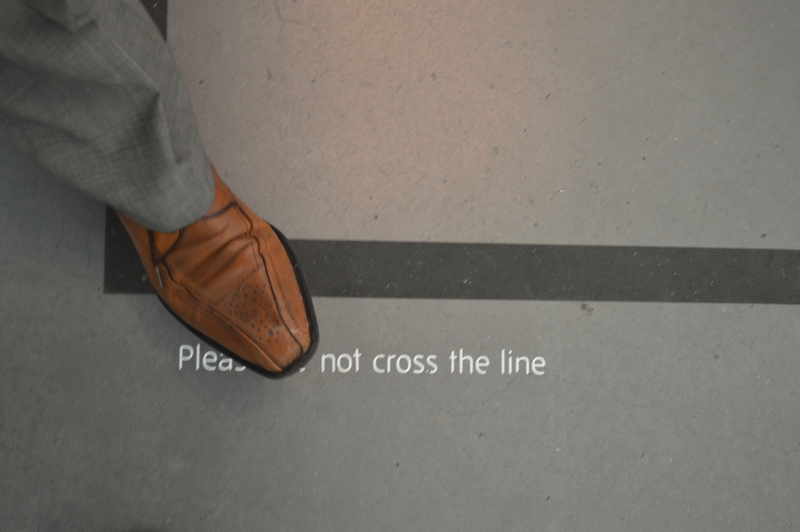 But I thought differently with every exhibit I came to. Such an open experience. Ah, Col, but Felix makes up his own mind. We just chose these two exhibitions for a stroll…or rather, dash. Another day it might be Turner. It seems there’s much here, besides the building, that might qualify as recycled. This post and Andra’s today are, to me, perfect bookends — try it, you might like it! Indeed, Karen. One often has to be there to appreciate things like this fully, and I would thoroughly recommend a visit to this wonderful place on any English tour. Thank you, Kate. One of my very favorite views of London. My VERY VERY favorite bridge. Felix is brilliant. I too love the Tate Modern. I stood in that very spot and watched the ants myself. Such an incredible building: it plays tricks with planes. MTM must love it; when I framed the picture of the ants in the piece it simply had to go horizontally, despite an urge to place it vertically, portrait style. Stunning place. “I like it but I have no idea why.” Spoken like a contemplative adult. Bravo, Felix, for even being there, much less pausing to ponder. Where were the cool interactive museums when I was young!? I know. they used to be dusty old dark-wood cupboards when I was little. How things have changed, PT! A conveyor belt! They didn’t have one of those when my hubby and I visited. Although, that was on our honeymoon nearly 17 years ago. They have all the mod cons, don’t they? Hi Cameron! I have learnt through much experience. The camera is a must: I can freeze-frame and look back later. Tandy, I heartily recommend it. Such spectacle. I remember that we gave our children memberships to Tate Modern in their twenties. I think the membership cards remain pristine and out of date. Sad…..I loved going there. 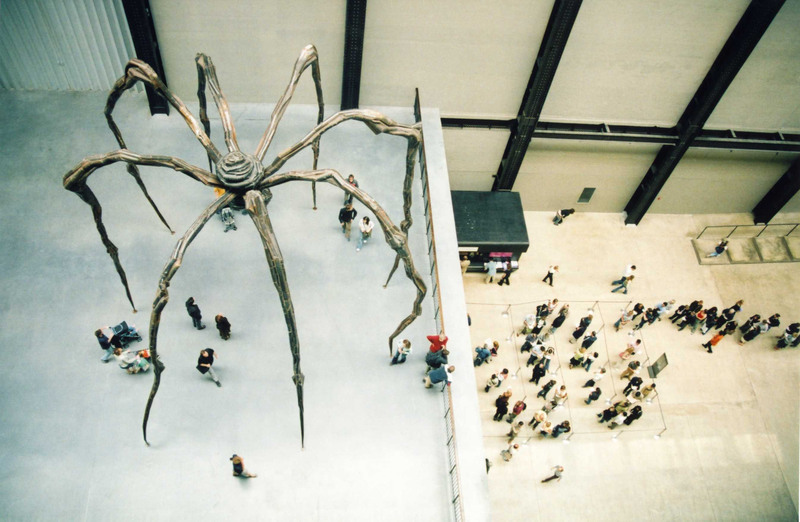 I still remember my amazement at Louise Bourgeois’ “Giant Spider” in the generator room near the entrance. “I like it,” said Felix ruminatively, “but I have no idea why.” – Felix has discovered the truth about art appreciation. Don’t ever change, dear boy. 🙂 That’s what I think, BB. But then, I am his mother. Nice – like cat burglars who leave the loot untouched. That makes me think about visiting an art museum during this year’s Summer Surf Adventure. I love Kandinsky’s work, and in the one you show I see a guy in a suit painting a picture. Many disparate comments – must be the output from my stream of consciousness. I love disparate comments, Rob. Nothing better than sparking off an untidy explosion of thought, is there? So many directions, so many projects. I loved the Kandinsky exhibition at the Guggenheim this Summer. It almost made up for the whole thing gallery swathed in sheets. Based on their site’s Kandinsky page it looks like they have a pretty good exhibit, but is the picture on that link their setup? Ah, next time you are in the area, Madhu…..
Love this dash and grab, Kate, and your telling is always so much fun. “I like it,” said Felix ruminatively, “but I have no idea why.” – just the feeling we often get with art, and really rather okay. Had to laugh at Phil crossing the line. My friend Kathryn, whom I love dearly and who plies me with her own lovely watercolors is a hazard to take to museums. She is so interested in technique, but, there are the guards who once, twice, thrice mutter “Ma’am, move away from the line” until I’m sure we are to be tossed out on our heads. Ha! The urge to get closer to these creations – to fathom why – is so strong that lines are almost immaterial until the attendant pipes up, Penny. Yours is a very familiar story to me. It sounds like a perfect day to me, Kate, and I think that Felix has the right idea about art. If it doesn’t sing to you straight away, move on. Of course, this way of thinking proves what an ignoramus I am. 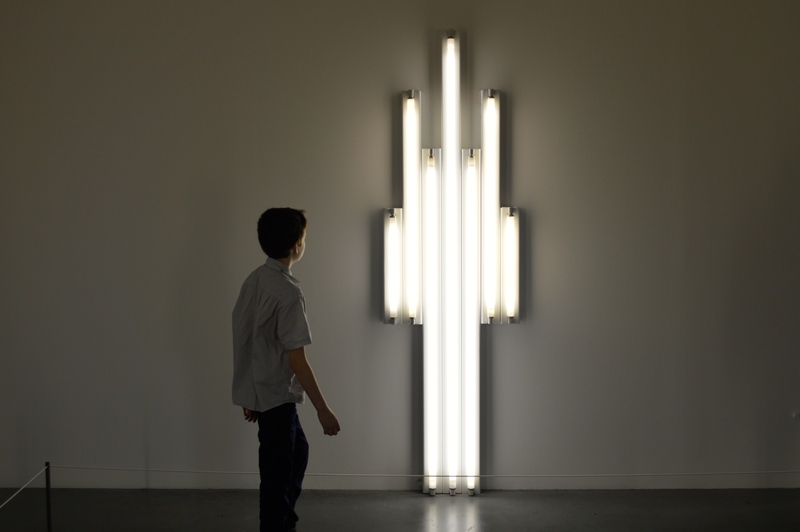 The next time you visit New York, try to make it over to MoMA’s fourth floor. That’s the floor Milton calls “the joke floor”. Felix might find it highly entertaining and I’m sure you wouldn’t be bored, either. We’ll look forward to that, Virginia. Sounds like it’s just up Felix’s street.